The Pinelands is a nearly one-million acre block of wilderness covering relatively level land on New Jersey's coastal plain, crossed by miles of sand roads and some marked trails. For a list of hikes in this region: click here. Fascinating and strange, the New Jersey Pinelands is a unique area with its own wild beauty. Close to the urban areas of New York and Philadelphia, the region is a broad expanse of relatively flat land roughly 80 miles long and 30 miles wide. It lies on the coastal plain and extends into nine counties in southern New Jersey. The region is entirely un-glaciated, with few hills and no rock outcroppings. A person flying over this area or driving its long straight highways is likely to think of the Pinelands [also known as the Pine Barrens] as wasteland. Pine forests, sometimes scorched or scrubby, cover vast sandy stretches with little sign of habitation, crops or livestock. But this remarkable physiographic and biologic province is far from being botanically barren. Despite the monotonous landscape of twisted pines, the region boasts a large diversity of plants, many of them unusual and unique to this area, and an equally large diversity of wildlife. A bewildering web of sand roads interlaces the thousands of acres of forests and cedar swamps of the Pinelands. Every now and then along these roads ghost towns appear, sometimes with one or two structures, and sometimes with a remnant of non-native vegetation - vague reminders of a flourishing past. Wharton State Forest contains a restored village, and several others in ruins. The miles of marked trails are few in comparison with the miles of sand roads, and include the Batona Trail, short nature walks in the state parks, state forests, and wildlife management areas, and trail networks in Belleplain State Forest and Wells Mills County Park. The Batona Trail is the longest hiking trail, running 49.5 miles through Brendan T. Byrne, Wharton, and Bass River state forests. The wildlife management areas [WMAs] often have multiple access points, such as the numerous sand roads which lead off of paved country roads. With no main entry point, the diamond-shaped WMA signs posted see along the roads are the easiest way to find the areas. An interactive map provided by New Jersey Department of Environmental Protection serves as an excellent overview of the Pinelands. In the more northern sections of the Pinelands activity by military aircraft is quite noticeable, where Fort Dix, McGuire Air Force Base, and Lakehurst Naval Air Station form a huge presence. 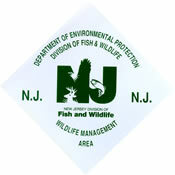 More information can be found at the website of the New Jersey Pinelands Commission.